Undergraduate students walk across the Bend OSU campus. Oregon State University – Cascades is serving a total of 1,204 students according to its official annual fall enrollment report. The Bend campus’s enrollment report represents a seven percent overall increase over the previous year and includes 306 first generation undergraduate students – nearly a third of the total undergraduate student body -- who are the first in their families to attend college. 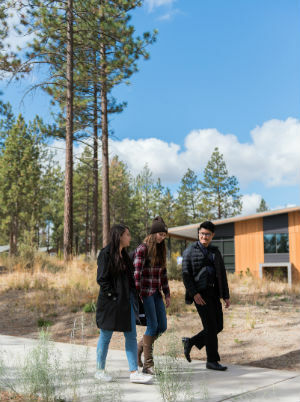 As the campus expands over the next decade, OSU-Cascades by 2025 will serve 3,000 to 5,000 students, most of them from Central Oregon, a region that has been historically underserved by higher education with many first-generation students and others who have been unable to attend college. Also included in the official fall enrollment total are 81 first-year students and 158 new transfer students. It also includes 249 total graduate students. The official fall enrollment represents more than a six percent increase in full-time equivalents as students increasingly take full-time course loads. Seventy-one percent of students are pursuing their studies full-time, when combining credits from OSU-Cascades, OSU on-line and Central Oregon Community College. The diversity of OSU-Cascades’ student body also includes 83 students who identify as Hispanic and 73 who represent two or more U.S. minorities. Ninety-two percent of OSU-Cascades students are from Oregon, with 67 percent coming from the Central Oregon region. Eight percent of students are from out-of-state, representing 28 other states, as well as seven countries. Nearly all of OSU-Cascades’ first year students this fall are Oregonians, with 48 percent coming from Central Oregon and 10 percent from the greater Portland area. The enrollment increase spread across majors, with the largest majors now reported as business administration, biology, human development and family sciences, kinesiology, and energy systems engineering. The average unweighted high school GPA of OSU-Cascades’ freshman class is 3.45, with 17 percent having a GPA of 3.75 and above. Six percent of first-year students came to OSU-Cascades with sufficient college credit to enter at the sophomore or junior level. Sixty-two percent of first-year students earned college credit while in high school. This fall term marks the first year that the OSU Honors College undergraduate degree is offered at OSU-Cascades. Nine students have embarked on the rigorous degree program in its inaugural year. The largest graduate program is the counseling degree program with 84 students. The Low-Residency MFA in Creative Writing has 19 enrolled students this fall. Growth in graduate student enrollment is attributed to professional development offerings for in-service teachers. Seventy-four students are receiving veterans benefits. Of those, 62 are active duty veterans and 12 are receiving veteran dependent benefits. The percentage of female students is 55 percent. The average age of an OSU-Cascades student is 29; the average age of a graduate student is 33. Eleven percent of students are under age 20. The youngest enrolled student is 17; the oldest is 78. OSU-Cascades is also serving an additional 60 Central Oregon students who are taking all of their courses online through OSU’s Ecampus. About OSU-Cascades: Oregon State University’s campus in Bend, Ore., features outstanding faculty in degree programs that reflect Central Oregon’s vibrant economy and abundant natural resources. Nearly 20 undergraduate majors, 30 minors and options, and three graduate programs include computer science, energy systems engineering, kinesiology, hospitality management, and tourism, recreation and adventure leadership. The Bend campus expanded to a four-year university in 2015; its new campus opened in 2017.